As we began our breakfast buffet in the hotel restaurant, an older lady passed by our table and asked, “Are you my roommates”? Puzzled, we quizzically looked up at her in silence. To which she added, “well are you on the boat?” We responded, “Yes, but we have our own room.” She replied, “Oh well, I haven’t met my roommates. Strange people are interesting.” Nicole and I weren’t exactly sure how to take that comment…were we strange? or interesting? and what made her think we signed up for a triple berth? Hmmm…I have promptly pegged her for the token, annoying shipmate…we shall see. We took advantage of the last few hours in our room because check out time was 11 and we weren’t boarding the boat until 4. Between 11 and our 3 pm bus ride to the boat, we opted to hike Martial Glacier. We were told it took 2.5 hours, but were unsure if that was one way or round trip, to the base or to the top. We wandered up the road from our hotel to the the ski lift located at the bottom of the ski mountain, with only one detour on a side trail that followed a creek beneath moss covered trees. Due to the unknown and time constraint, we booked up the steep, rocky terrain and made it to the base of the glacier in just under an hour, though we didn’t stop for many pictures of the aqua marine stream that tumbled by the trail. We climbed so quickly that our racing heart rate warmed our bodies despite the cool mist that cloaked our skin. The good news is, our fast arrival to the base left us with ample time to scamper up the face of the glacier. 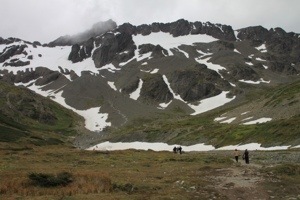 We followed the even steeper trail, more suited for mountain goats, up to a point where it was covered in icy, snow. While the trail was traversable and flattened out in this area, we decided it would be a good time to stop, as the views of the town below were fantastic. We were not in proper attire to reach the top (nor did it even look like anyone could make the ice covered summit), and we were almost out of time. Our pace down was even faster than our pace up, though sometimes not by choice. It was almost hard not to jog at times when facing such steep grades. I was wishing I had my hiking poles and quietly thought to myself don’t get hurt an hour before embarking on the Sea Spirit to Antarctica. We made it back to the hotel in one piece with 20 minutes to spare. We were greeted by thirteen, energetic expedition staff members from Quark Expeditions. The expedition leader, Cheli, is from new Zealand and seems like a character. Other staff on board included experts in ornithology, glaciology, and biology to name a few. The introductions and orientation were fast and furious…I’ll be learning everyone’s name along the way. The introductions took place in a large, presentation room on deck three. Deck four included the bar and the captain’s bridge was on deck five as was the outdoor hot tub and gym. Our cabin was much bigger than I expected. We opted for the cheap seats on deck two, also the location of the expedition staff cabins, and the dining room. We might not have a floor to ceiling window, only two port holes, but we won’t be rocking as much when we cross the Drake Passage, the worse waters in the world. The owners suite is on Deck Six…I hope those folks aren’t prone to sea sickness! Along with our two port holes, were two twin beds; a sitting room with a couch, chair, table, and tv; lots of cabinets for storage; a vanity; two closets; robes and slippers; daily life vests and life vests for evacuation; and a small bathroom. It was definitely spacious, but I wasn’t planning on spending much time in the room anyway. We couldn’t set sail without completing the lifeboat drill, so all the passengers adorned the orange life vests and followed guides to the appropriate locations on the ship. After following all instructions, settling in and enjoying a nice dinner, we got fitted for our bright yellow parkas (ours to keep after the trip) and rubber boots. During the evening, we hung out on the deck waiting to spot albatross and penguins in the smooth waters of the Beagle Channel. Evidently there were some penguins on the distant shore, but I couldn’t make them out. Soon, the pilot boat which was guiding us through a portion the channel, veered off and we were on our own to navigate the rest of the channel and the Drake Passage. 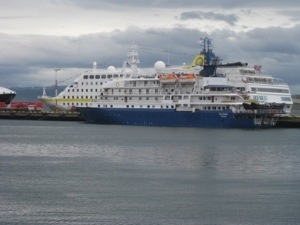 Our ship, the Sea Spirit, was built in 1991 by a company in Italy. It is owned by a company in Denmark and operated by a company in Florida while registered in the Bahamas…WHEW! Its overall length…297 feet. Its gross tonnage…4,200. It can carry 133 tons of potable water and also has the capacity to produce water. It can travel at 14.5 knots. There are 60 passenger cabins and 35 crew cabins. 114 tourists are traveling on this expedition and almost as many crew are necessary to operate the ship! Here’s to the Sea Spirit, formerly known as Renaissance 5, Mega Star Sagittarius, Sun Viva, and Spirit of Oceanus…may we have a safe journey.